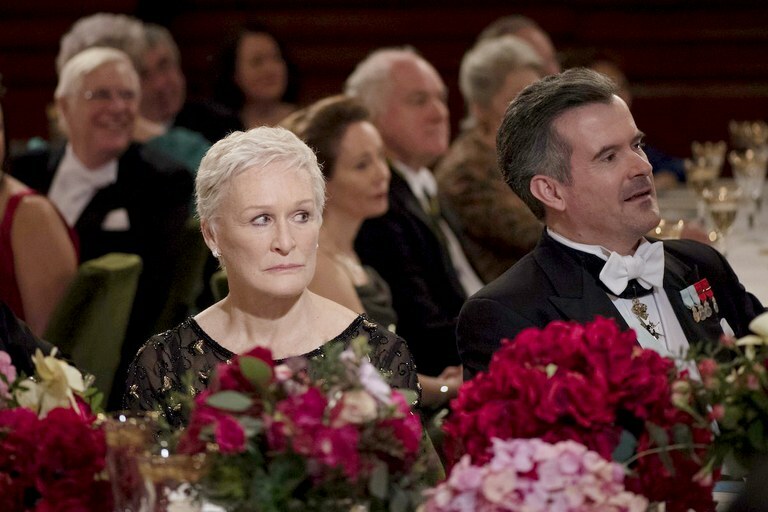 Much of the critical response to Bjorn Runge’s excellent new film, The Wife has rightfully focused on the wonderfully subtle, yet astonishingly powerful performance by Glenn Close as Joan, the wife of Joe (Jonathan Pryce), a celebrated author who wins the Nobel Prize for Literature at the film’s opening. I instead want to reflect upon The Wife’s representation of the literary tradition. Joe has a penchant for quoting literature he doesn’t seem to care to understand; he babbles some nonsense about Cervantes’ Don Quixote. But, he reserves the greatest amount of damage for the last line of James Joyce’s short story, “The Dead” (1914): “His soul swooned softly as he heard the snow falling faintly through the universe and faintly falling, like the descent of their last end, upon all the living and the dead.” The odious Joe—a serial philanderer who only lives for his own pleasure—uses these lines profanely, to seduce. He first invokes Joyce in the writing class. Then, we hear Joe quoting Joyce, as Joan stumbles upon her geriatric husband pathetically trying to seduce the beautiful young photographer assigned to document his experience at the Nobel celebration. Joe is so lacking in self-awareness that he mangles the implication of Joyce’s words as they pertain to his absurdly insignificant life. In The Wife, it is Joan who has an epiphany. She has written the material that wins the Nobel Prize. For decades, she has bottled up the resentment created by a patriarchal publishing industry which denied her the human dignity of being acknowledged for her brilliant writing. Her passion explodes at the end of the film. Like The Wife, whose title tells us that it is a film about Joan (and not the actual Nobel Prize recipient), Joyce’s story splits our attention between Gabriel and his wife, Gretta. In a cab to their hotel, returning from a feast celebrating the Epiphany, Gretta reminisces about Michael Furey, her lover who died when he was just seventeen years old. For the rest of night, Gabriel obsesses over his foolishness, his inability to understand his wife all these years. He left the party in good spirits, delighted with his physical and intellectual control over her. Now devastated, the selfish Gabriel retires to their bedroom, and looks out the window at the snow. Joyce ends all the short stories in his collection, Dubliners with such epiphanies, moments of self-awareness that stab at both the character and the reader. 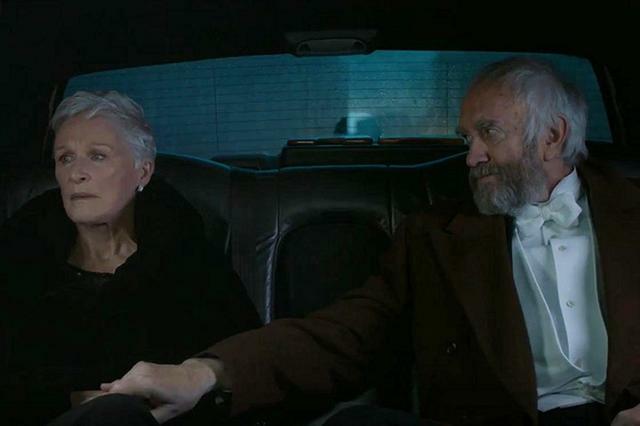 The Wife features a string of reconstructions of the cab ride home at the end of “The Dead.” In two-shots, we see Joan and Joe sitting in the back seat of a limousine scurrying them around Stockholm for various Nobel events. Unable to fully confront the horrid way her husband has misused her talent, Joan does not have a Michael Furey backstory. Instead, she sits silently, as she has for most of her life. Joe, always filling the air with his self-centered anxieties, can therefore never approach Gabriel’s epiphany about his worthlessness. In a flashback to 1958, Joan takes care of Joe’s and his first wife Carol’s infant in their bedroom. She picks up Joe’s copy of Joyce’s modernist masterpiece, Ulysses (1922). She opens the front cover and caresses the white pages, blank except for Joe’s name scribbled at the top. Joyce’s monstrous novel ends with an astonishing soliloquy by Molly Bloom, who laments the state of womanhood in patriarchal Ireland. Unlike the withheld epiphany in the limousine rides, the ending of The Wife outdoes Molly Bloom in intellectual prowess. Joan finally unleashes her pent-up resentment, screaming at Joe that she is leaving him, and upon their return to the U.S., she will hire a lawyer to divorce him. In his final act of selfishness, Joe has a heart attack and dies in their bed in Stockholm. On the flight home, Joan has her finest moments as a thinker and a human being. The odious Nathaniel (Christian Slater), Joe’s would-be biographer, comes to talk with Joan and her son, David (Max Irons). Nathaniel continues to troll for juicy material for the book with which he hopes to make himself famous. With icy precision, Joan threatens Nathaniel with legal action if he even intimates that it was her who wrote her husband’s novels. Nathaniel skulks away. The altercation awakens David, who is still curious whether Nathaniel’s theory about the authorship of the books is true. Joan ends by lovingly telling him that, upon their arrival back home, she will sit him and his sister down and tell them the whole story. 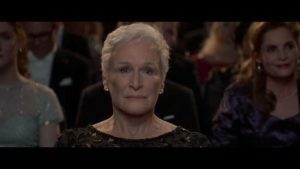 The film, and the secret Nobel Prize winning novelist herself, saves her greatest act of storytelling for her loved ones, denied to the public within the film, and to us, the public watching the film. Unlike Molly Bloom, Joan will not be lying virtually alone, next to her useless husband. Instead, she will be with her daughter and newly born grandson. She will also finally be able to nurture her son, an aspiring writer who possesses his mother’s talent, finally freed of the anxiety of influence created by his succubus father. The ending of The Wife thus reconstructs the ending of Ulysses in an astonishingly complex way. On the one hand, both fictions end with Molly and Joan explosively expelling the demons constructed by men’s control over women. On the other, Molly’s modernist stream-of-consciousness rant is replaced by Joan’s mature, controlled mastery over the social space around her. Exorcising her caressing of the white pages of Joe’s copy of Ulysses those many years ago, Joan opens her notebook to two fresh white pages. Neither page contains Joe’s name; Joan is ready to begin a new phase in her writing career. Driven by the force of what surely must be Glenn Close’s first Oscar, Joan ends The Wife as fully deserving of the Nobel Prize in Literature which she has earned, but which will be forever shrouded from the living and the dead.